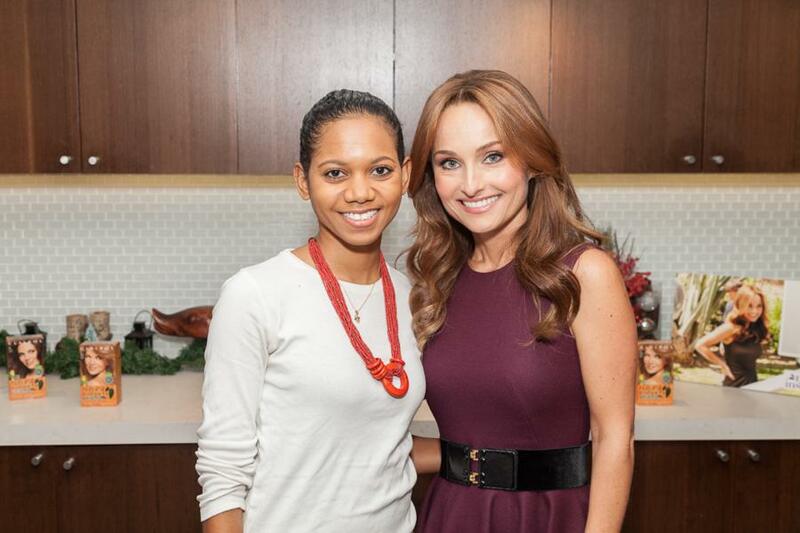 Celebrity Chef and Clairol spokesperson, Giada De Laurentiis got together with us bloggers to share some of her healthy recipes before the holidays. She chatted about how Clairol Natural Instincts is a part of her healthy lifestyle and how you can eat healthy and well, starting today. Giada De Laurentiis is known for many things, one of which is her stunning good looks, hair included. Her commitment to living healthy translates into her hair care. Clairol Natural Instincts provides a healthier way to color your hair. As I’m sure you can guess, healthy at-home hair coloring is all in the ingredients. If there are harsh chemicals in your hair color system, you’re sure to see harmful results on your locks. Natural Instincts is made with aloe, vitamins and anti-oxidants. The ammonia-free system is the only at-home hair coloring system proven to be less damaging to your hair. That means you can get vibrant, glossy hair color at home. At just $8.99, this is a steal. It comes in 32 different shades. Use it to blend away grays, subtly enhance or brighten your existing color or make it warmer or cooler. The process takes all of 10 minutes and gradually washes out after 28 shampoos. This means that you don’t need to worry about that dreaded rootline. Giada uses this system because it’s perfectly in line with her healthy lifestyle. If you’re looking for a testament of how beautiful this hair color system works, look no further than Giada’s locks. Her hair is honestly a bit distracting, in its beauty. I couldn’t even tell that she colored her hair. It looked so natural. Click here to see all the shades and see where you can but it. Besides her stunning hair, Giada happens to also know her way around a kitchen. She whipped up a few delights for us, one of which is the Chocolate Avocado Mousse. I know what you’re thinking. Avocado in chocolate??? Yes. She did it and it worked. It was so delicious and light and perfect for treating yourself. I had a chance to chat with her and she told me that she loves dark chocolate because it’s healthier. Want to try it out for yourself? Check out the easy recipe below. water. Stir until the chocolate is melted and smooth, about 3 minutes. Set aside to cool slightly. Place the melted chocolate, avocados, cocoa powder, agave, vanilla, and salt in a food processor. love Giada and i eally like the avocado dessert – nice twist thanks!